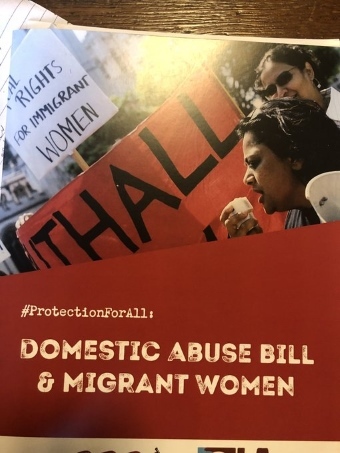 The women's rights group Southall Black Sisters on March 20th published a briefing paper calling for the Government's draft Domestic Abuse Bill to properly include migrant women. You can read the briefing paper online here. The Government published its draft Domestic Abuse Bill in January, but Southall Black Sisters say they are disappointed that while the Bill was promised to be a 'landmark' act that would offer protection for all women, it fails to deliver anything of substance for migrant women. The briefing paper states that vulnerable migrant women with unsettled immigration status are effectively excluded from the few protective measures that are contained in the Bill. While the Bill makes reference to support for victims of domestic abuse who have 'no recourse to public funds' (NRPF), Southall Black Sisters say it fails to remedy the desperate circumstances in which many abused migrant women subject to NRPF - who do not enter the UK under spousal/partner visas and are therefore subject to NRPF - find themselves. The group says measures for migrant women in the Bill are "woefully inadequate" and not fit for purpose. "We have repeatedly demonstrated that migrant women are particularly exposed to higher rates of domestic and sexual violence as well as harmful cultural practices, sexual and economic exploitation, domestic abuse-related homicide (including 'honour' killings) and suicide. As a result of the NRPF rule, they are also more likely to face homelessness and destitution, exploitation and concordant mental health problems. And yet this group of women find it extraordinarily challenging to access support. Their NRPF status prevents them from accessing public funds or support," the briefing paper states. It continues: "[Migrant women with NRPF] are routinely turned away even by those agencies that are set up to provide support for abused women or humanitarian care. Many services simply do not have the specialist skills to assist women with insecure status. Others lack the resources to do so. Refuges tend not to accommodate women with NRPF because of the lack of any certainty as to how long they will have to accommodate women on a rent-free basis. The Women's Aid Nowhere to Turn Project (2017) identified an average of only one refuge space per region in England available for a woman with NRPF. Women with insecure status are also often too afraid to access health services or police protection as they fear (with considerable justification) that these services are linked to immigration enforcement." Southall Black Sisters says the UK is breaching human rights law and the draft Domestic Abuse Bill fails to remedy this. "We consider that the continuing exclusion of migrant women from protection amounts to a breach of the UK's obligations under domestic and international human rights law, in particular the European Convention of Human Rights (ECHR), the Convention on the Elimination of All Forms of Discrimination against Women (CEDAW) and The Council of Europe Convention on Preventing and Combating Violence against Women and Domestic Violence 2011 ('the Istanbul Convention')," the group said. Southall Black Sisters says it is vital that no abused woman is left behind when seeking protection and this must be enshrined in the Domestic Abuse Bill.